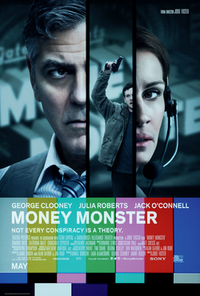 Money Monster is an upcoming 2016 American thriller film directed by Jodie Foster and written by Alan Di Fiore, Jim Kouf and Jamie Linden. The film stars George Clooney, Julia Roberts, Jack O'Connell, Dominic West and Caitriona Balfe. It follows a TV personality, Lee Gates, and a viewer, Kyle Budwell, who takes Gates as a hostage after losing his family's money on a bad tip by Gates. Filming began on February 27, 2015, in New York City. TriStar Pictures is set to release the film on May 13, 2016. This webpage uses material from the Wikipedia article "Money_Monster" and is licensed under the GNU Free Documentation License. Reality TV World is not responsible for any errors or omissions the Wikipedia article may contain.